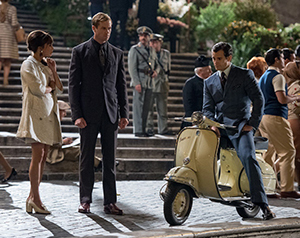 The Man from U.N.C.L.E. is a fizzy cocktail with a light buzz that almost makes it all the way through the climax. There are two scenes in Guy Ritchie’s latest that are great movie moments, the kind of scenes that make moviegoing a pleasure. And, to be clear, having two such moments in one movie is pretty remarkable these days. The first features the lovely Alicia Vikander (Ex Machina) as Gaby. It’s 1963 and she’s been co-opted into a mission to keep nuclear weapons out of the hands of a resurgent Nazi faction. She teases her stoic chaperon, working undercover as her fiancé. That’s Illya Kuryakin (Armie Hammer, The Lone Ranger). He’s a Russian super spy with anger issues. So, the waif Gaby drinks a bit too much too quickly in their posh hotel room and she starts to dance in extra-large Holly Golightly-esque sunglasses. She’s in the background, slightly blurred, with Illya in the foreground, ignoring her. Gaby’s motions are cinematic bliss. When Illya rejects her invitation to join her, she turns it into a wrestling match and slight triumphs over mights as she pins Illya to the floor. She then, slowly, seductively... passes out. Both are Guy Ritchie at work with his “A” game. The director of Robert Downey Jr.’s Sherlock Holmes adventures has turned his cinema-savvy eyes on rebooting the 1960s spy series before dusting off the legend of King Arthur. An argument could be made that this Man from U.N.C.L.E. is a case of style over substance, after all, one of the marketing taglines is, “Saving the world never goes out of style.” But, hey, when the style is this good, sip the wine and enjoy the ride. Indeed, there are loads of eye-popping visuals. Beautiful people driving beautiful cars while decked out in beautiful clothes and listening to beautiful music. Life is a cabaret, ol’ chum, and in here everything is beautiful. And certainly this movie is packed with cinematic style. Split-screen images, subtitles that pop on the screen with a large — sometimes extra large — serif font. Ritchie fills the screen with terrific composition. It’s an attention to visual layout that is striking to see and fun to watch. And in IMAX, with its superior audio presentation, things get turned up to 11. All of this is accompanied by Daniel Pemberton’s suitably bubbly score. It’s not about super-sleuth theme music in this case. Here, it’s about wrapping the experience in the environment, capturing a sense of time and place. With the bulk of the action taking place in Italy, there’s a heavy use of Italian pop songs, from the ‘60s, of course. It’s somewhat reminiscent of Gabriel Yared’s work in The Talented Mr. Ripley. Napoleon’s a James Bond-like lover who manages to keep his suit tidy and his face mostly unharmed. Illya, on the other hand, is the product of a rough childhood and, well, his life hasn’t gotten much better. He’s the fighter. And sometimes he’s put through the mill, haymaker and whatever else might be available. Like Tom Cruise’s Mission: Impossible series, U.N.C.L.E. is respectful of, if not necessarily completely faithful to, its source material. This isn’t a tasteless exercise in mockery like Get Smart or Land of the Lost, it’s a legitimate revisitation of the TV series, which ran from 1964-1968. Cruise’s series has its own remarkable claim to fame with the latest — and fifth — installment, Rogue Nation, arguably being the best so far. U.N.C.L.E. flirts with greatness, but doesn’t quite reach that heady state. The climax doesn’t quite convey a sense of urgency. The fate of the free world is, after all, on the line, but the action feels more of an obligatory step to get to the end than a true, tension-building pulse-pounder. And maybe, just maybe, that’s by design. Since when have being tense and frazzled been in vogue? The movie ends with the tease of a trip to Istanbul. Maybe it’s the setup for a proposed sequel. Maybe not. Playing it safe, the end credits are accompanied by photos from this new U.N.C.L.E.’s visit to Istanbul. Expecting to see more from that adventure seems reasonable. Sequels are, of course, very much in style these days.